Total: 1 hr. 10 min. 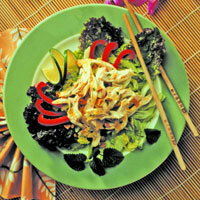 A coconut curry marinade tenderizes the chicken in this salad and infuses it with a sweet juicy flavor. Rinse chicken, pat dry. Split chicken in half with a large, sharp knife. In a large bowl whisk curry powder into the coconut milk. Blend in lime juice, fish sauce, garlic, cilantro, and brown sugar. Add chicken, turning to coat in marinade. Cover bowl; refrigerate at least 4 hours or overnight. Preheat charcoal grill or oven broiler. Place chicken on grill or broiler, skin side down. Turn after about 10 minutes. Cook until juices run clear or fork can be inserted into the chicken with ease, about 30 minutes. Cool chicken slightly; cut into strips. Combine all of the dressing ingredients and stir until the sugar dissolves; set aside. Arrange red lettuce leaves on six plates. Combine shredded lettuce, bell pepper, and mint; place on top of the red lettuce leaves. Place an equal portion of chicken onto each plate. Sprinkle with peanuts and drizzle with the dressing.